Concerning poets, Tom House once noted that “now and again / a good one learns / laughter.” Living in New Jersey, one needs a good sense of humour partly because, as a resident, you and your state are always being laughed at and, as the collective butts of jokes, “we should call every truth false which was not accompanied by at least one laugh” (Friedrich Nietzsche). Fully aligned with the message of this pairing is a homegrown poet, Tony Gruenewald, whom I met years and years ago and taught me by example that poetry can be funny, poignant, and obscenely beautiful. His talent is not constrained to image-driven curtness. Consider, also, the title piece, which is a narrative that humourously displaces timelines and augments history to become a poetic piece of NJ propaganda. 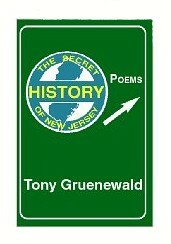 Guenewald makes as much use of the sound of language as he does its meanings, every which one his twisted mind creates in its own twisted image(ry)…which just happens to be things you can actually see in New Jersey. Here, poet serves as translator, proclamator, and lover for his home state. Like all good lovers, he takes the good with the bad. Like all good poets, he makes both a delight to read. Some other samples of his work can be found linked to on his website and on amazon.com (click the cover)…more than enough material that will convince you to buy the book. I dunno…it would take a hell of a lot for me to start appreciating New Jersey….. If Bon Jovi, the Boss, and Sinatra couldn’t overcome…. She was born with a tail. That’s right.